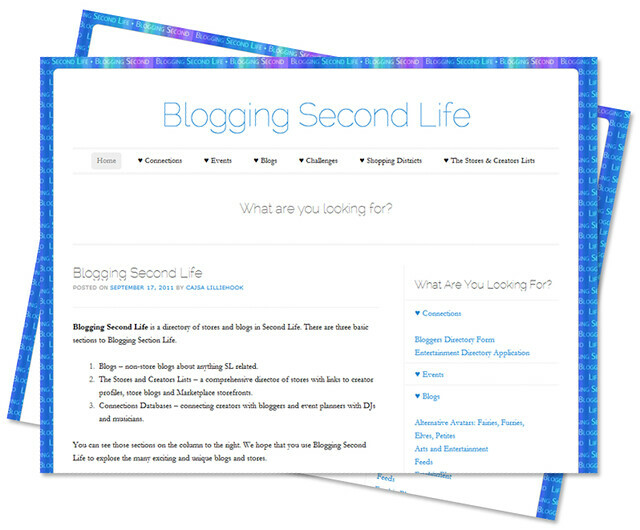 Are you listed at Blogging Second Life? Blogging Second Life is a directory of stores and blogs in Second Life. There are three basic sections to Blogging Section Life. Blogs – non-store blogs about anything SL related. The Stores and Creators Lists – a comprehensive director of stores with links to creator profiles, store blogs and Marketplace storefronts. Connections Databases – connecting creators with bloggers and event planners with DJs and musicians. You can see those sections on the column to the right. We hope that you use Blogging Second Life to explore the many exciting and unique blogs and stores. When I blogged about Blogging Second Life back in October of last year, it was just starting out. Now the BSL directory has thousands of SL blogs listed, and also categories for Events, Challenges, a Store and Creators List, and also the Connections Database. I recommend the BSL directory all the time, to designers who are looking for new bloggers to promote their brand, or just bloggers looking for something to do. The Events page is impressive! Oh, very nice, thank you for the tip! Hey Gogo, I just registered to BloggingSL. Nice timing you talk about it.